Note: Poly tarps are listed as a cut size - finish size is 3% to 5% smaller. 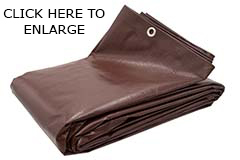 Our 8.0 ounce super heavy duty brown tarps are durable and designed for continuous indoor/outdoor use. The high density 8 ounce per square yard, 16 mil thick, 16x16 weave fabric is coated on both sides with a brown polyethylene that provides waterproofing & UVI protection to add extended life. Rustproof aluminum grommets approximately every 18" as well as reinforced corners provide ample tie down locations for your convenience. Our brown tarp is one of the strongest poly tarps in the industry today! 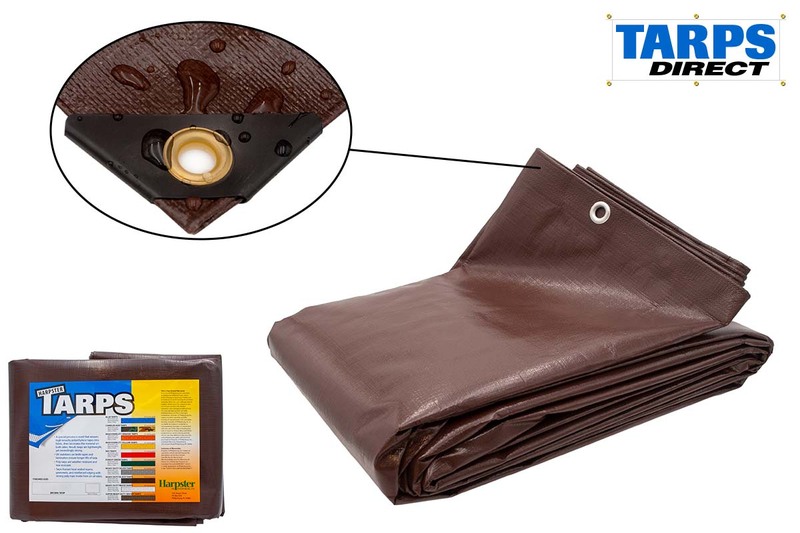 Tarp Direct's super heavy duty Brown tarp is 8 ounces per square yard of strong and durable laminated polyethylene. Besides being aesthetically pleasing in an outdoor environment; it is the best tarp for your heaviest and hardest jobs. The Brown super heavy duty tarp is great for construction, landscaping, farming and commercial needs as well as the homeowner that is looking for long term solution for protecting important items.